These days I guess I'm getting pretty close to living my childhood dreams. 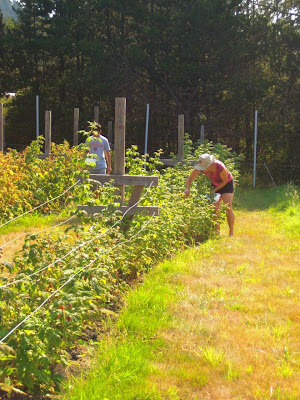 Each week during harvest time, we cut lettuce, pluck basil, slice off squash, pull carrots, onions, and beets, clean garlic, and head out to the top of the farm behind our farm store to the berry patch where we stand and crouch and thrust our hands into the thorny canes to get at the warm, ripe berries. Me and visiting little brother Cam, raspberry picking. We grow blueberries, lingonberries and raspberries in our small patch. There are also a couple of thornless blackberry canes that were a gift from another islander, which haven't yet produced. 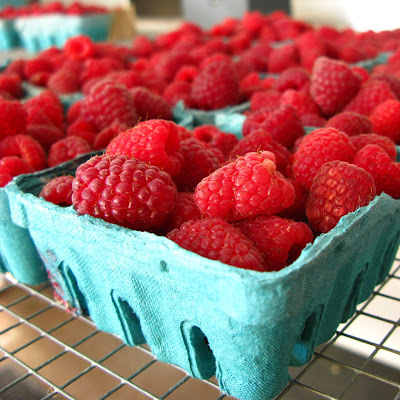 This year on the farm was the first year that there's been enough yield to sell any raspberries. In the past, most of the fruit has gone to the "house shelf" where the farm family gets our bounty of cosmetically imperfect, but ridiculously delicious, produce. This year, there have enough berries to sell in the farm store and even at market, and still some left over to top waffles and cakes. Most things on the farm are extremely precise -- bed rotations are planned and replanned to ensure the right rotations of plant families; transplants are placed just-so to maximize nutrition and water for each plant and minimize weeds and water-loss. But the berries represent slightly wilder side of the farm, an unpredictable section filled with plants of different varieties (quarter-sized raspberries, translucent jewel-y red and sweet next to deep purple tiny berries, fuzzy, opaque, and deep in raspberry flavor). Picking berries is an exercise in restraint and patience. Some fruit calls out -- plump, shiny magenta but upon reaching out to pinch and tug, the fruit is still hard and resists pulling. You can keep pulling and force off a tart and tasteless berry, or you can leave it be and come back in two days to sweet, softened maroon perfection. Then there are the moments when a huge full perfect berry calls out to be eaten. But on a working farm, berries are a cash crop -- even in our small quantities -- and there are plenty of less-beautiful berries that can't be marketed, but can be enjoyed warm, right from the bush. Yes, it's a stretch, but I can't help but draw lessons from the berries. Lately, I've been trying and trying to figure out where to go and what to do with myself post-farm. I've been trying to settle on a path and "pick" off a niche, but having just entered the field of sustainable agriculture and food and having just hit the 4-month mark on the farm, I guess I can't expect any of my berries to be quite ripe. 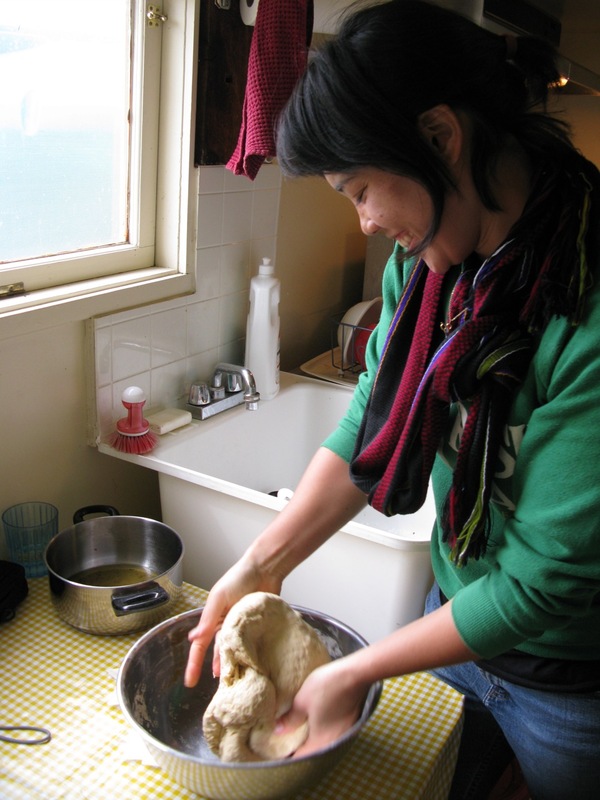 For now, there's observation and waiting and maybe some preparation tasks (life weeding?) to get myself ready for what comes. The canes have been winding down over the past couple of weeks. Their slowing seemed to signal the start of the end of summer. But yesterday, my visiting siblings and I took a walk in the summer sun and found some of the first ripe blackberries of the season. Being so close to food is nice -- when one thing goes, another thing comes. Very cyclical and very reassuring. Nice, now I'm totally craving raspberries! Good thing I was planning on going to Whole Foods tonight! @ Jen -- Yay! 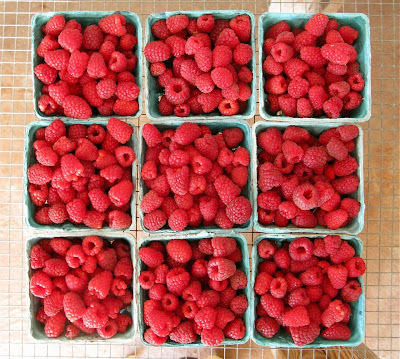 Raspberries are so delicious. My parents and I got some boysenberries this weekend too -- HUGE and so so flavorful. We ate the whole flat in a couple of days. @ Heddy -- I love blueberries too! We grow some here, but only just enough for the "farm family" to get a few each week. They're pretty hard to grow because they require relatively acidic coil pH and very well-drained dirt to grow in. those look delicious! i loved walking in your berry patch and it's so cool to see the "finished" products. and your berry metaphor is adorable (i think in some ways it is hard to outgrow our english major selves, no?) yet wise. hope you had fun with your family when they visited!